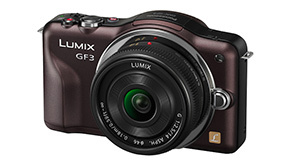 Panasonic has today launched the LUMIX GF3, its smallest and lightest interchangeable lens LUMIX G system camera*. Easy to use and bursting with features, the LUMIX GF3 puts high-quality images in the palm of your hand. Innovative design: New breakthroughs in innovative design means the LUMIX GF3 is Panasonic�s small and light interchangeable lens camera, but still packed full of advanced technology. With an aluminium chassis, built-in flash, easy-to-handle grip and a choice of four colours, the LUMIX GF3 will be the perfect everyday companion. Take the step to high quality photography: A Micro Four Thirds 12.1-megapixel Live MOS sensor offers gives both superior image quality and low power consumption. The advanced sensor, alongside the high-performance Venus Engine VII HD images processor, lets you take beautiful photos and high-definition movies wherever you are, even when shooting in low-light situations. Full HD Movies: The LUMIX GF3�s quality advances are not restricted to still photos. Now you can record the world around you in stunning AVCHD Full HD (1080i, sensor output 25fps), with Dolby sound. With full time Auto Focus and Auto Focus Tracking, the camera will automatically lock onto the subject of your movie and follow it even as it moves. A dedicated button on the top lets you instantly start recording movies when a sudden opportunity arises. Rich colour reproduction with Intelligent D-range Control: With Intelligent D-range Control, the LUMIX GF3 allows photographers of all levels to achieve the rich colour reproduction expected by professionals. Colours appear more natural than ever, as the camera optimises the exposure and ensures that gradation and individual details are artfully reproduced. Absolute creative control: The GF3�s Creative Control mode lets you add visual effects to your photos that have previously required software post processing, including Retro, High Key, Sepia and High Dynamic. In addition, portrait presets allow finer adjustment of contrast, sharpness, saturation and noise reduction to get the perfect shot. Outstanding speed: For exceptional photography, speed is of the essence. High-definition burst shooting at 4 FPS means you can pick out the perfect shot from a fast moving subject, while the LUMIX GF3 focuses automatically in approximately 0.18 seconds(2), meaning you�ll never miss the moment. Once you�ve locked the focus onto the subject with just one touch, the GF3�s AF Tracking mode will follow it even if as it moves. Control-wheel An innovative control wheel � featured for the first time in a Panasonic LUMIX G series camera � lets you easily scroll through your images and the camera�s key functions. Intuitive auto-focus: The AF is not only fast but extremely accurate, letting you get the perfect shots when a sudden opportunity arises. You can choose from a wide range of AF modes � including Pinpoint AF which allows extremely precise near�pixel-level focus point calibration with the touch of your finger. In contrast to other technologies that limit the number of fixed hardware focus points, Panasonic�s Pinpoint AF can be set by touch control to very fine points anywhere on the LCD screen. Built-in flash: With an integrated flash, the GF3 gives you take the perfect photos, whatever the light level. With just a press of a button, the spring-loaded flash mechanism will be ready to use. The world�s largest range of Micro Four Thirds lenses: The LUMIX GF3 gives you the widest range of Micro Four Thirds lenses to choose from to make sure you have the right set up for the right job, including the newly unveiled H-H025 25mm/F1.4 lens. For more information on the company and the Panasonic brand, visit the company's website at panasonic.net/. (2) * The time for focusing on the subject is measured with LUMIX G VARIO HD 14-140mm / F4.0-5.8 ASPH. / MEGA O.I.S. (H-VS014140) to move the lens position to �2m� from �infinity� position. The zoom position is in wide range. Panasonic measurement method.